GREAT ZIMBABWE HOTEL – The Commission of Inquiry into the Sale of State Land in and around urban areas has accused Goddard Dunira, a nephew to former Minister of State for Masvingo Provincial Affairs and his land development partner and MP for Chivi Central Ephraim Gwanongodza of hiding a bank account holding $1.25 million that the pair received from an international donor organisation. Commissioners also expressed shock at the use of names of fictitious churches and companies by the two to allegedly hide ownership of commercial stands illegally obtained from Vashandi Housing Scheme in Victoria Range in Masvingo in which Dunira and Gwanongodza are chairman and treasurer respectively. The Commission also fear possible massive tax evasion by land barons in Masvingo after they bumped into a letter in a Vashandi file in which the author plotted tax evasion. 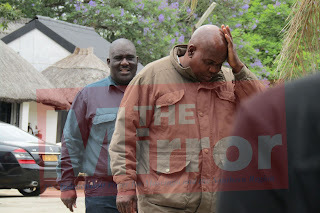 The Commissioners also discovered that Dunira and Gwanongodza were allegedly transferring money from Vashandi Bank accounts into the account of Rajivic, a private land development company which the two jointly own as shareholders and directors. The two are signatories in the Vashandi bank accounts. Two weeks ago the Commission instructed Dunira and Gwanongodza to submit all financial and bank statements pertaining to Vashandi Housing Scheme. On perusing the books during a hearing on Friday, the commissioners discovered monthly payments of between $10 000 and $26 000 that the co-operative has been making to Rajivic and another company called Goddarm Investment. “A lot of money is going out of the co-operative every month. I can see that you are transferring money from Vashandi into an account owned by Rajivic, your private company. There are even bigger payments into an an organisation called Rajivic. What is it for?” asked another Commissioner. The duo said that the instalments were for repayment of a $1,25 million loan obtained from Rajivic for the construction of 250 core houses for members. Commissioners then looked for the loan entry in the financial books but could not find it. Dunira and Gwanongodza also failed to find the entry in any of the organisation’s submitted books and bank accounts. Cornered and pressed, the visibly shaken pair told the Commission that the loan was deposited into an small scale enterprise account which had since been closed. “So you have another account which you did not disclose? And you say that the account has ceased?” asked Commissioner Petronella Musarurwa. Justice Uchena who chairs the Commission then proposed to Gwanongodza and Dunira that the session be adjourned so that the two could go and collect the statement from the Bank. The pair told the Commission that the statement could not be obtained from the Bank the same day. “We cannot proceed without that statement on the loan, it is important and I propose that we adjourn and allow the two to go and collect it from the bank,” said Justice Uchena. Justice Uchena then asked the pair for a date on which it will be ready with the bank statement. The two dithered until Justice Uchena proposed to give the pair a letter instructing the Bank to release the statement. At that point, Dunira said he had a daughter who was ill and he would not be free to attend the hearing the following week. He proposed that he be replaced at the hearings by another member from Vashandi but commissioners felt that a new person would take them back in terms of progress. Justice Uchena eventually declared that the hearing be continued in Harare since the Commission is winding up its business in Masvingo this Saturday. Dunira who seemed no longer interested in attending the hearings reluctantly accepted. At some stage as commissioners perused through financial statements, they came across an internal letter in which one member of Vashandi was advising others against forming a private company as this would attract the attention of the taxman. “We should avoid forming a company because this will attract tax,” read part of the letter. A commissioner read out the letter and asked Gwanongodza and Dunira what they meant by the letter and the answer was barely audible. The Commission set aside the letter.